The theme for EHA 2015 is “diversity” in economic history. Diversity refers to differences in economic outcomes by race, ethnicity or tribal group, religion, location within countries (for example, urban vs. rural, or North vs. South), gender, and other attributes and how these evolve over the course of economic development. Papers documenting these differences in historical settings are an integral part of the program, as are papers that measure the impact of various institutions or government policies (for example, the Civil Rights Movement in the United States) or that examine long run trends in economic inequality more broadly construed. Graduate students are encouraged to attend the meeting. The Association offers subsidies for travel, hotel, registration, and meals, including a special graduate student dinner. For more information refer to the Call for Papers. The online registration system for the 2015 Annual Meetings is closed. You may register onsite at the meetings. You can find information on the travel and other practical matters in the Meetings Brochure that you can download here: EHA 2015 Brochure. The full conference booklet can be found here: EHA 2015 FULL PROGRAM BOOKLET. You can explore Nashville dining options by perusing the restaurant guide here: GuidetoSelectedNashvilleRestaurants. You can also explore the great Nashville attractions here: NashvilleToDo. The full papers will be linked to the program in late August, along with further program details. The EHA book exhibit showcases the various publications (books, journals etc.) in the field of economic history, economics, history, and political science, with top academic and scholarly presses included. Those attending the conference; please encourage your publishers to display your work at the meetings. It’s a great way to get a wider scholarly audience for your publications. Usually about 250+ people attend the meetings. And the proceeds help us support the participation of graduate students at the conference. THE CUTOFF DATE FOR RESERVATIONS IS AUGUST 10, 2015! The conference is hotel is the Sheraton Downtown Nashville located in the heart of the city. Moreover, you can find more information about the area here: http://www.sheratonnashvilledowntown.com/things-to-do-in-nashville. The conference rate is $169 per night (single or double room), plus tax. To ensure the accuracy of your reservations, please make reservations in one of the following two ways. To ensure the accuracy of your reservation, please make reservations in one of the following two ways. 1. By booking online here. 2. By calling Sheraton reservations at 1-888-627- 8565. Please be sure to request to book rooms with the Economic History Association 2015 Annual Conference to receive the discounted group rate. The deadline for receiving the group rate is August 10, 2015. *Note: Hotel space is always at a premium at the EHA meetings, so please reserve your room early to ensure availability. If you experience any difficulties in making your reservations, please contact Jari Eloranta (elorantaj@appstate.edu). The closest airport is the Nashville International Airport: http://www.flynashville.com/. You can find ground transportation options here: https://www.flynashville.com/ground-transportation. Another option is an airport shuttle. There are several companies that provide this kind of service. The EHA does not endorse any in particular—we urge you to look for them online. The official shuttle company of the airport is this one: http://www.jarmontransportation.com/home.html. Parking at the hotel is $24 per day (self, $26 for valet) for conference attendees. Nashville is a great city for eating out and enjoying live music, among other things. If you want to explore the varieties of restaurants in the downtown area, see the suggestions contained here: GuidetoSelectedNashvilleRestaurants. For various downtown attractions, see these (among others): NashvilleToDo. 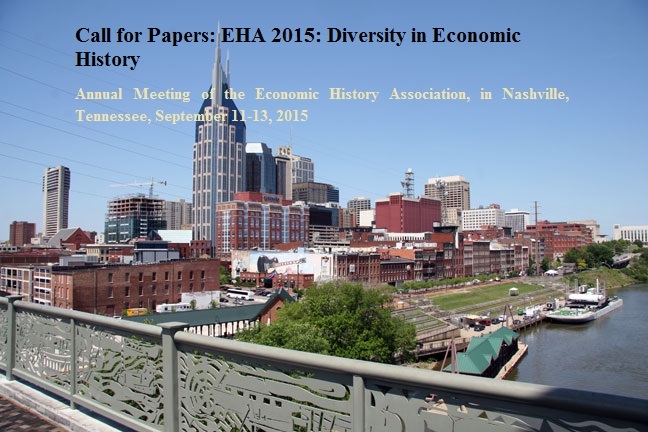 The theme for EHA 2015 is “diversity” in economic history. Diversity refers to differences in economic outcomes by race, ethnicity or tribal group, religion, location within countries (for example, urban vs. rural, or North vs. South), gender, and other attributes and how these evolve over the course of economic development. Papers documenting these differences in historical settings have been selected as part of the program, as are papers that measure the impact of various institutions or government policies (for example, the Civil Rights Movement in the United States) or that examine long run trends in economic inequality more broadly construed. The Program Committee (Martha Bailey, University of Michigan (chair), together with Tomas Cvrcek, Theresa Gutberlet, and Suresh Naidu) has finished making their selections and all the submitters have been told of the selection. Individuals who presented or co-authored a paper given at the 2014 meeting are not eligible for inclusion in the 2015 program. Moreover, those that have been accepted as part of the program need to send the Meetings Coordinator Jari Eloranta an updated abstract by July 15. Paper and session submissions are now closed. Graduate students are encouraged to attend the meeting. The Association offers subsidies for travel, hotel, registration, and meals, including a special graduate student dinner. A poster session welcomes work from dissertations in progress. Applications for the poster session are now closed. The decisions will be forthcoming in mid-June latest. Those students wishing to just attend the meetings need to contact the Meetings Coordinator. The dissertation session, convened by Marianne Wanamaker (University of Tennessee) and Eric Chaney (Harvard University), will honor six dissertations completed during the 2014-2015 academic year. The submission deadline has now passed and no more submissions will be accepted. The Alexander Gerschenkron and Allan Nevins prizes will be awarded to the best dissertations on non-North American and North American topics respectively. Dissertations must be submitted as a single PDF file. Files of less than 5 MB in size may be sent directly to the conveners as an email attachment. All dissertation competition submitters will be notified whether they were selected as finalists in mid-July.